An ALMA antenna at the end of a long-baseline. 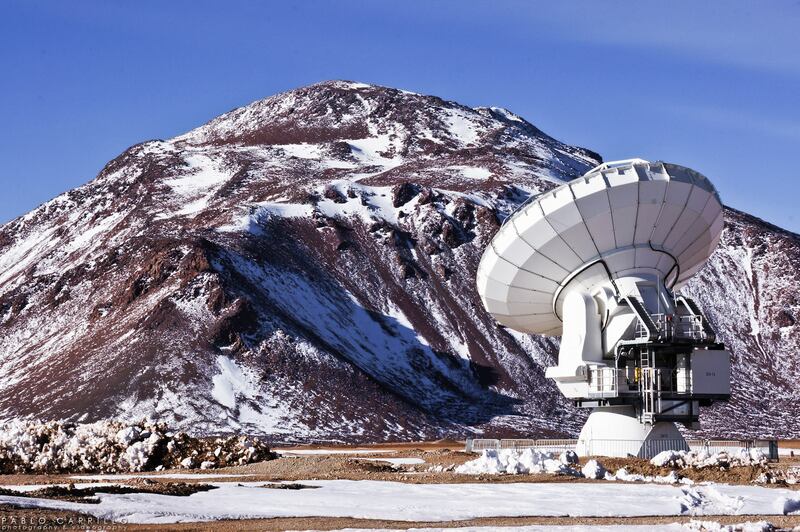 ALMA began Cycle 3 observations as scheduled on 15 October with the array in its long baseline, C36-8 configuration. Baselines in this configuration span 267 m to 12.645 km, providing a beam size of ~0.06 arcsec at 100 GHz, with a maximum recoverable scale at that frequency of 1.4 arcsec. Several antennas remain on 15 km baselines for testing purposes. Although weather has been suboptimal, perhaps owing to El Nino conditions in the Pacific, several schedule blocks using this new and non-standard capability are now in the process of analysis, calibration, and imaging for delivery to ALMA Principal Investigators. The ALMA Status Page has several new features: the Chajnantor precipitable water vapor and phase stability, the array configuration, and project observation status may all be monitored there. ALMA continues to accept requests for projects with urgent observing needs through its program of Director’s Discretionary Time (DDT). DDT proposals should conform to the capabilities available for the Cycle 3 Call. The Proceedings of the December 2014 international ALMA conference held in Tokyo, Japan –Revolution in Astronomy with ALMA: The Third Year – are being printed and distributed. Congratulations are due to the conference hosts at the National Astronomical Observatory of Japan for creating an informative and full-color record of the conference presentations. The next North American ALMA Science Center Workshop – Molecular Gas beyond the Milky Way: Astronomy and Astrochemistry in Extragalactic Environments – will be held in Charlottesville, Virginia at the Omni Hotel 4-7 April 2016. Please visit the Workshop website for additional information and to pre-register. Additional information regarding this NAASC Workshop will be published soon in eNews and at the NRAO science website. 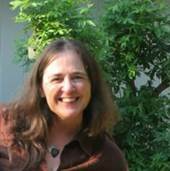 I am pleased to announce that Lyndele von Schill has been selected as the Director for the NRAO Office of Diversity & Inclusion. In this role, she will play a key role within the Director’s Office in achieving the mission of increasing and advocating for staff diversity and inclusion across the Observatory. Lyndele will provide leadership and oversight for NRAO’s local, national and international broadening participation and diversity initiatives. Oversight and coordination of the National Astronomy Consortium (NAC) and the NRAO National / International Exchange (NINE) Programs is an Observatory priority. With the assistance of the NRAO Diversity Council, Lyndele will develop and implement creative programs and enhance existing programs to improve the recruitment, retention, and success of under-represented and under-served populations and staff with the overarching goal of fostering a work environment that is inclusive of all individuals. Lyndele will also work closely with all levels of staff and will serve as Chair of the Diversity Council. This role closely partners with the NRAO Human Resources and Education & Public Outreach teams, and all NRAO Department Heads to set NRAO’s strategic diversity initiatives. Lyndele obtained a B.S. in Diversity & Communication in Organizations and is currently pursuing a Master of Education, Learning and Technology degree. She has been actively involved in several diversity organizations on a local and state level and has a solid background in program development and management. Lyndele assumed her new role on 21 October and is looking forward to reaching out to staff across the Observatory to continue NRAO’s mission of creating an inclusive work culture that values and respects the talent and contributions that everyone brings to NRAO. Applications for the 2015 Robert L. Brown Outstanding Doctoral Dissertation Award should be submitted to RLBrownAward@nrao.edu by 31 January 2016. 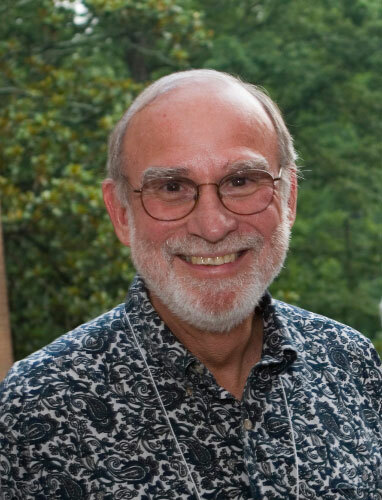 This recognition of outstanding achievement by a 2015 Ph.D. recipient was established by NRAO and Associated Universities, Inc. on behalf of Bob Brown’s friends and family to honor Bob’s life and career. For further information, please visit the Robert L. Brown Award website. Questions may be addressed to RLBrownAward@nrao.edu. Elizabeth Nance (St Mary's College of Maryland) at the October REU Symposium at NSF Headquarters. NRAO Research Experiences for Undergraduates (REU) student Elizabeth Nance (St Mary’s College of Maryland) was one of four astronomy students invited to present her research at the REU Symposium in Arlington, VA in October. This symposium was organized by the Council on Undergraduate Research (CUR) and gave Elizabeth the opportunity to display an outstanding poster on her research in the atrium of the National Science Foundation (NSF) headquarters, with students from a variety of STEM fields and a number of NSF Program Officers and REU Coordinators in attendance. 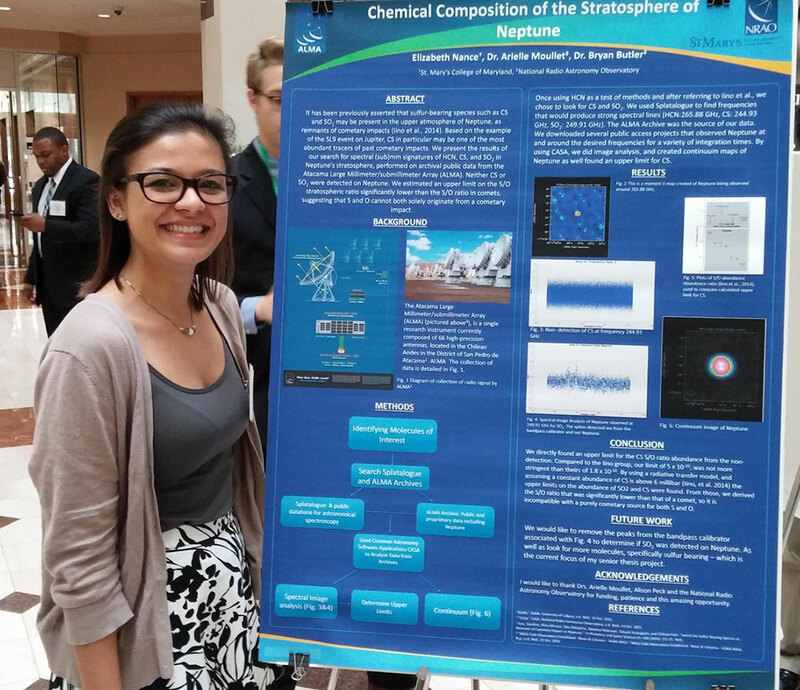 Elizabeth’s research on The Composition of the Upper Atmosphere of Neptune was carried out in Charlottesville this past summer under the guidance of NRAO scientific staff member, Arielle Moullet. NRAO Student Programs Coordinator Alison Peck accompanied Elizabeth to Arlington and participated in a number of workshops for REU program organizers on recruiting, broadening participation, and professional development curricula for summer student programs. Several recent scientific papers that describe research based on NRAO telescope time and data, and/or including an NRAO author have neglected to included this acknowledgement. 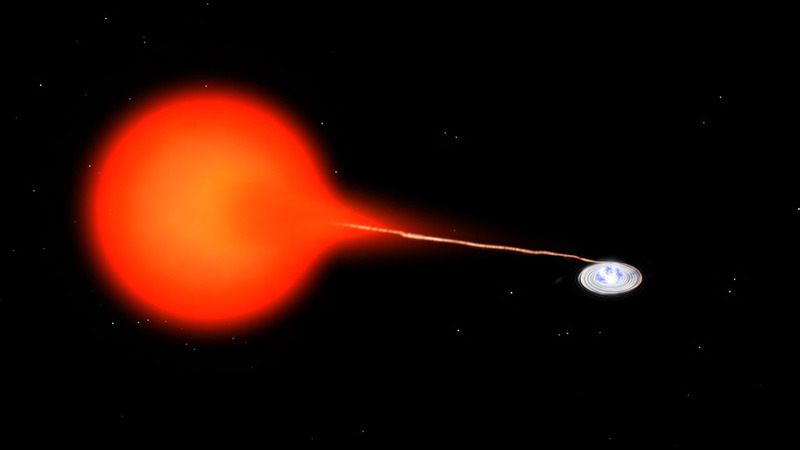 Given the volume of the current astronomical liteatures, such papers can be easily missed and, thus, be left out of the official NRAO publications database and performance metrics. Please be careful to include this brief acknowledgement, whenever appropriate, in your scientific publications. Additional information regarding the NRAO acknowledgement – and page charges – is available at the NRAO Library website or by contacting NRAO Librarian Marsha Bishop (+1.434.296.0254). 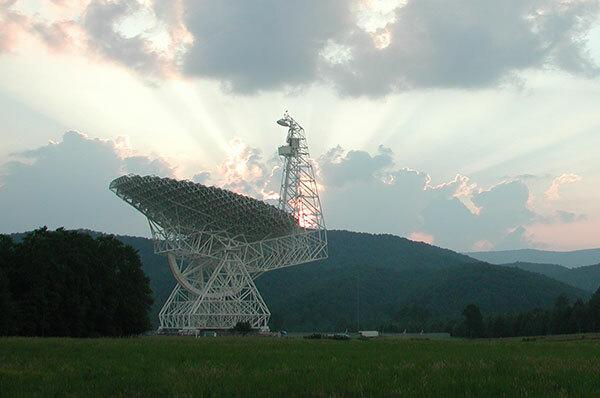 Due to recent changes in the way the U.S. Federal Communications Commission will handle licensing of cell phone transmitters, a more diligent approach to monitoring and mitigating any cellphone Radio Frequency Interference (RFI) must be undertaken by Green Bank Telescope observers and the Green Bank Interference Group. We request that observers report any RFI they encounter in the frequency ranges listed below to interference@nrao.edu, including information such as time, duration, intensity, topocentric frequency, azimuth and elevation. Without your help and prompt RFI reporting, we will not be able to mitigate these potential RFI sources in a timely fashion. In addition to the frequencies listed above, we appreciate your reporting any RFI detected in any observation conducted at NRAO – Green Bank. 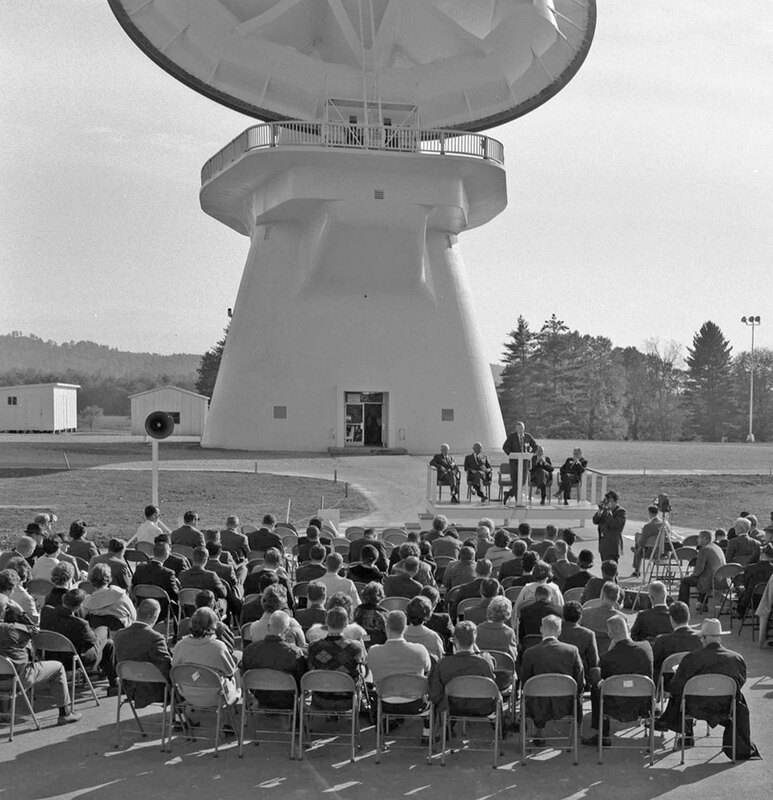 On 13 October 2015, fifty years to the day after the dedication of the 140-foot Telescope on 13 October 1965, 70 retirees and friends and 80 current employees gathered in Green Bank to celebrate the 50th anniversary of that dedication. The day began with brief talks: the first by Frank Ghigo on the construction of the telescope and attendant problems, and the second by Dave Hogg on the ways in which the exciting observations in the first few years changed our view of the Universe. Attendees were transported to the telescope for lunch, a proclamation from the Governor of West Virginia honoring the telescope, tours of the telescope, and a wonderful exhibit in the rooms at the entrance level of photos and objects illustrating the telescope's construction and use. Items were gathered for a 140-Foot Telescope time capsule that will soon be buried. 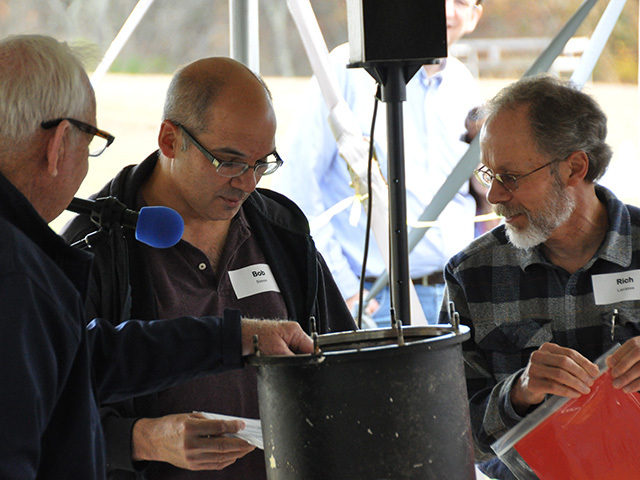 The afternoon's festivities included opening the time capsule buried at the 300-Foot Telescope during its 25th birthday symposium in 1987, with Bob Vance, Rich Lacasse, and Bob Simon pulling out wondrous treasures (see From the Archives below). 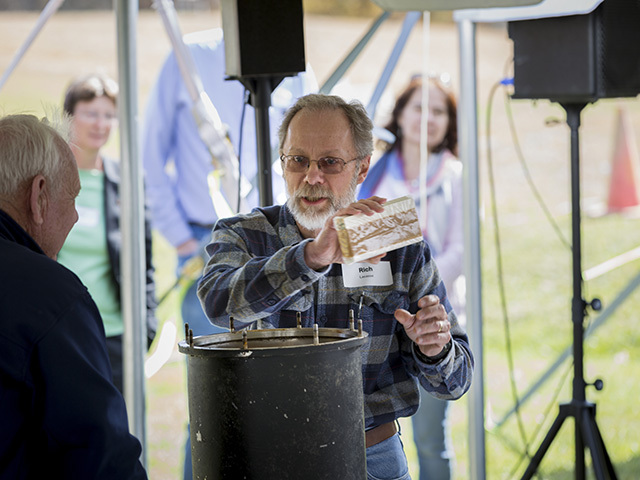 The afternoon ended back at the Jansky Lab, where attendees enjoyed showings of the two Peter B. Good films from the mid-1960s – The Lift and Construction of the 140-Foot Telescope – and several recently digitized 2-3 minute films from 1958-1959, including the 14 August 1958 ground-breaking, the concrete pour for the pedestal, and the original shaft moving up the road from the Bartow rail siding in September 1959. Everyone enjoyed a festive day of seeing old friends and celebrating this remarkable instrument. The NRAO Annual Report for calendar year 2014 describes the year’s science highlights and summarizes the numerous science, development, operations, and construction activities that were conducted across the Observatory from 1 January – 31 December 2014. 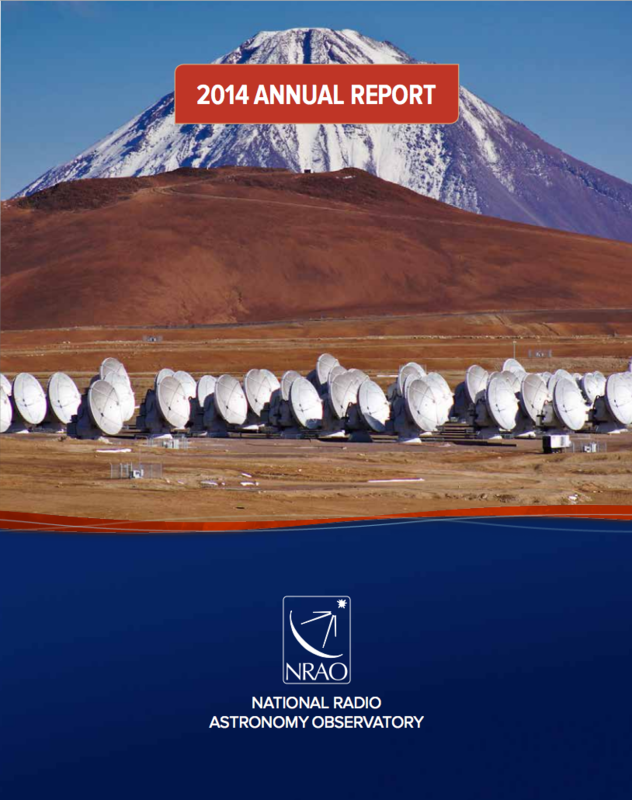 The 2014 NRAO Annual Report can be accessed as a pdf download or for interactive on-line viewing. 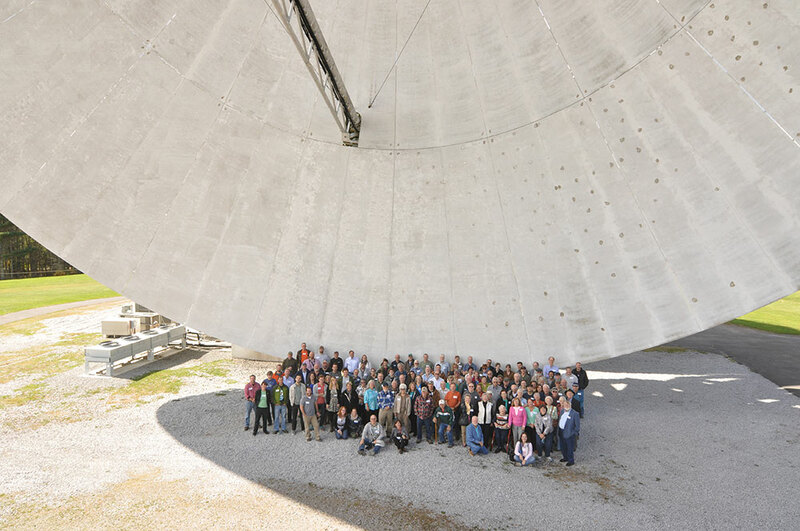 About this month's photograph: The 13 October 2015 celebration of the 50th anniversary of the dedication of the 140-Foot Telescope (see article above) included the opening of a 300-Foot Telescope time capsule, buried during the telescope’s 25th birthday symposium in 1987. In this photo Bob Vance, Bob Simon, and Rich Lacasse peer into the time capsule at treasures yet to emerge. For additional photos of the retrieval and opening of the capsule, see the slideshow below. The capsule was a receiver test dewar. After all items were placed inside, the air was vacuumed out and nitrogen gas pumped in, creating dry and inert conditions that allowed the contents to remain pristine during their 28 year burial. Among the many treasures retrieved from the time capsule were a 1987 coin set, photos of the 300-Foot Telescope interior and equipment, a 4.8 GHz cooled GaAs FET amplifier (with a note saying it did not work but perhaps someone else could make it work! ), a July 1987 issue of PC Magazine, an URSI meeting paper on the development of the spectral processor for the 300-Foot, an AM29516 16x16 multiplier, the first 300-Foot control program (on punched cards), and a 17 September 1987 Pocahontas Times containing an article on the 300-Foot Telescope birthday party. There were also some photos and other items related to the 140-Foot Telescope that will probably go into its time capsule, which is being prepared. Thanks to Mike Holstine, Gene Runion, and the NRAO Education & Public Outreach team for photos. 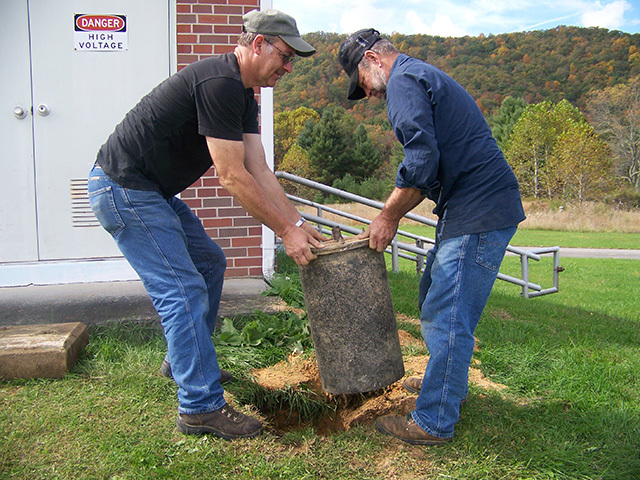 Daryl Shinaberry and Rusty Taylor remove the time capsule from its burial place outside the 300 foot control building. 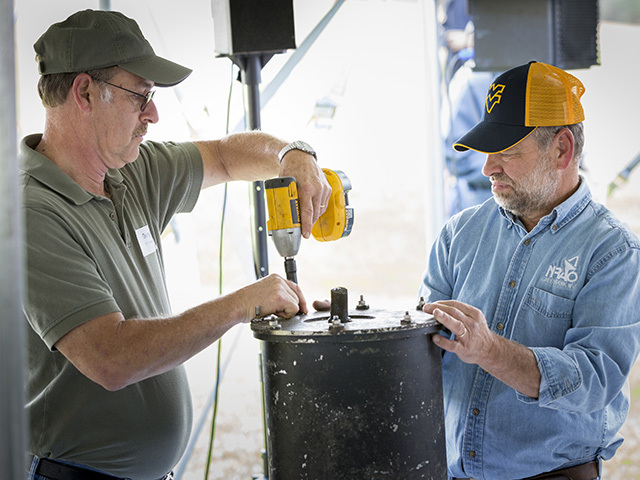 Daryl Shinaberry and Rusty Taylor remove the lid; an audible 'whoosh' was heard when the seal was broken. 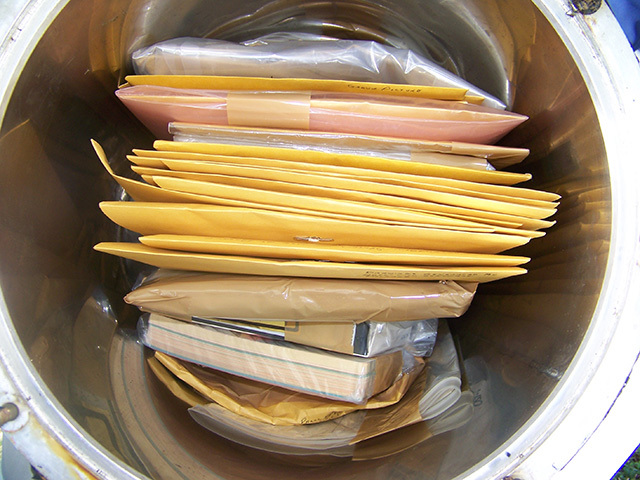 The contents of the time capsule - in pristine condition! Bob Vance removes an item from the capsule. 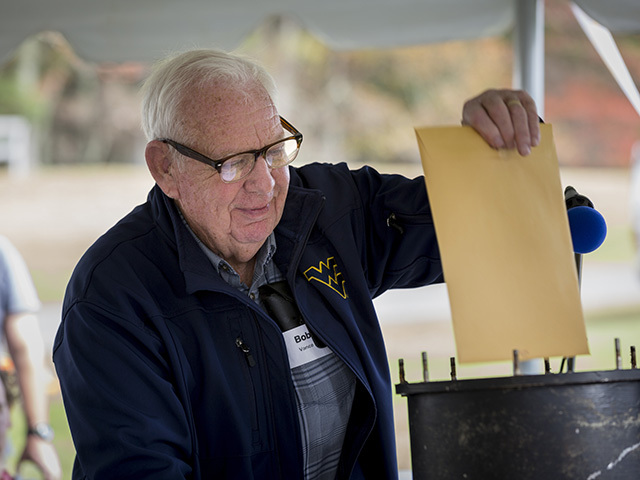 Rich Lacasse shows off the pack of punched cards containing the 300-Foot Telescope control program. 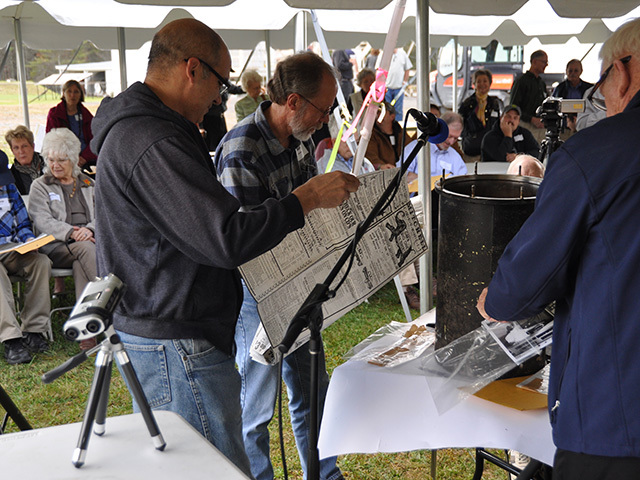 Bob Simon, Rich Lacasse, and Bob Vance (and attendees in the background) examine time capsule treasures. 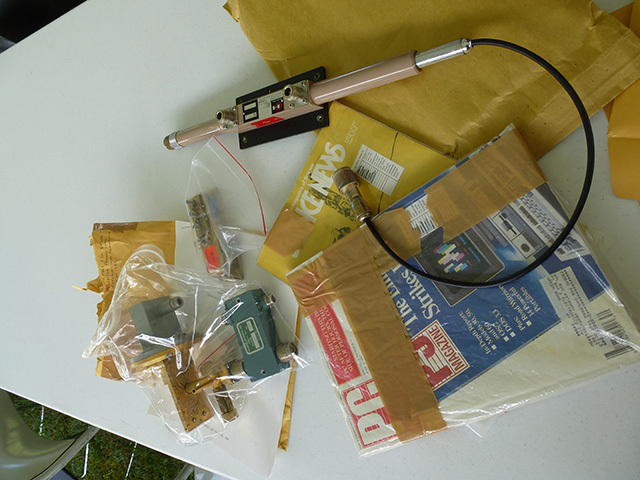 Some items from the time capsule.